We currently stock over 200 raw chinese herbs, herbal formulas, homeopathics and natural medicinals. From colds to pains, every ailment can benefit from a natural herbal remedy. At Perfect Ohm, we custom our herbal consults to give you the best formulation there is. Dr. Lopez is a master herbalist and uses her knowledge to create custom formulas for her patients. Herbal medicine is the basis for most pharmaceuticals and can aid in the effective treatment of many conditions. Herbal Consultations can now be offered over the phone, and you can purchase your custom formula directly from our online Apothecary shop. 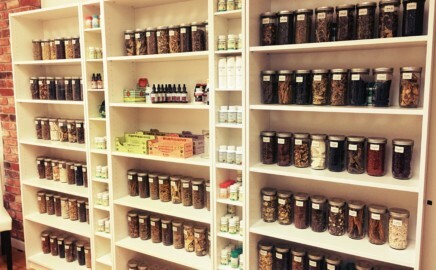 We house over 300 raw Chinese herbs and formulas as well as homeopathic remedies and aromatherapy oils. With these, we can make custom herbal formulas to be cooked and taken as tea, or granulated and encapsulated into pills for ease. Chinese raw herbs can be used for a huge array of ailments, as they have such high therapeutic properties. Please note, herbal products are very strong and must be prescribed with care. Therefore, prior to prescribing or having the ability to purchase any of our herbs, you must sit for a herbal consultation. Each formula and remedy is custom-made for our clients, and not one formula is fitted per symptom. On the contrary, it is fitted for the client – our holistic approach.